[J23] "IoT Data Prefetching in Indoor Navigation SOAs", Andreas Konstantinidis, Panagiotis Irakleous, Zacharias Georgiou, Demetrios Zeinalipour-Yazti and Panos K. Chrysanthis, ACM Transactions on Internet Technology (TOIT '18), Vol. 19, Iss. 1, Article 10, pp. 21 pages, 2018. [J22] "Internet-based Indoor Navigation Services", Demetrios Zeinalipour-Yazti, Christos Laoudias, Kyriakos Georgiou and Georgios Chatzimiloudis, IEEE Internet Computing (IC '17), IEEE Computer Society, Vol. 21, Iss. 4, pp. 54-63, Los Alamitos, CA, USA, 2017. [J21] "Crowdsourcing Emergency Data in Non-Operational Cellular Networks", Georgios Chatzimilioudis, Constantinos Costa, Demetrios Zeinalipour-Yazti, Wang-Chien Lee, Information Systems (InfoSys '17), Elsevier Science Ltd., Vol. 64, pp. 292 - 302, Oxford, UK, 2017. [J20] "Distributed In-Memory Processing of All k Nearest Neighbor Queries", Georgios Chatzimilioudis, Constantinos Costa, Demetrios Zeinalipour-Yazti, Wang-Chien Lee and Evaggelia Pitoura, IEEE Transactions on Knowledge and Data Engineering (TKDE '16), Vol. 28, Iss. 4, pp. 925-938, 2016. [J19] "Managing big data experiments on smartphones", Georgios Larkou, Marios Mintzis, Panayiotis G. Andreou, Andreas Konstantinides and Demetrios Zeinalipour-Yazti, Distributed and Parallel Databases (DAPD '16), Springer US, Vol. 34, Iss. 1, pp. 33-64, 2016. [J18] "Privacy-Preserving Indoor Localization on Smartphones", Andreas Konstantinidis, Georgios Chatzimilioudis, Demetrios Zeinalipour-Yazti, Paschalis Mpeis, Nikos Pelekis and Yannis Theodoridis, IEEE Transactions on Knowledge and Data Engineering (TKDE '15), Vol. 27, Iss. 11, pp. 3042-3055, 2015. [J17] "A network-aware framework for energy-efficient data acquisition in wireless sensor networks", Panayiotis G. Andreou, Demetrios Zeinalipour-Yazti, George S. Samaras and Panos K. Chrysanthis, Journal of Network and Computer Applications (JNCA '14), Elsevier North-Holland, Vol. 46, pp. 227 - 240, 2014. [J16] "Crowdsourced trace similarity with smartphones", Demetrios Zeinalipour-Yazti, Christos Laoudias, Constandinos Costa, Michail Vlachos, Maria I. Andreou and Dimitrios Gunopulos, IEEE Transactions on Knowledge and Data Engineering (TKDE '13), IEEE Computer Society, Vol. 25, Iss. 6, pp. 1240-1253, Los Alamitos, CA, USA, 2013. [J15] "Intelligent search in social communities of smartphone users", Andreas Konstantinidis, Demetrios Zeinalipour-Yazti, Panayiotis Andreou, George Samaras and Panos K. Chrysanthis, Distributed and Parallel Databases (DAPD '13), Springer US, Vol. 31, Iss. 2, pp. 115-149, 2013. [J14] "Crowdsourcing with smartphones", Georgios Chatzimiloudis, Andreas Konstantinidis, Christos Laoudias and Demetrios Zeinalipour-Yazti, IEEE Internet Computing (IC '12), Special Issue: Sep/Oct 2012 - Crowdsourcing, May 2012. IEEE Press, Vol. 16, Iss. 5, pp. 36-44, 2012. [J13] "Power efficiency through tuple ranking in wireless sensor network monitoring", Panayiotis Andreou, Demetrios Zeinalipour-Yazti, Panos K. Chrysanthis and George Samaras, Distributed and Parallel Databases (DAPD '11), Springer Press, Vol. 29, Iss. 1-2, pp. 113-150, 2011. [J12] "In-network data acquisition and replication in mobile sensor networks", Panayiotis Andreou, Demetrios Zeinalipour-Yazti, Panos K. Chrysanthis and George Samaras, Distributed and Parallel Databases (DAPD '11), Springer Press, Vol. 29, Iss. 1-2, pp. 87-112, Hingham, MA, USA, 2011. [J11] "Optimized query routing trees for wireless sensor networks", Panayiotis Andreou, Demetrios Zeinalipour-Yazti, Andreas Pamboris, Panos K. Chrysanthis and George Samaras, Information Systems (InfoSys '11), Elsevier Science Ltd., Vol. 36, Iss. 2, pp. 267-291, Oxford, UK, 2011. [J10] "A multi-objective evolutionary algorithm for the deployment and power assignment problem in wireless sensor networks", Andreas Konstantinidis, Kun Yang, Qingfu Zhang and Demetrios Zeinalipour-Yazti, Computer Networks (ComNet '10), Elsevier North-Holland, Vol. 54, Iss. 6, pp. 960-976, New York, NY, USA, 2010. [J9] "Finding the K highest-ranked answers in a distributed network", Demetrios Zeinalipour-Yazti, Zografoula Vagena, Dimitrios Gunopulos and Vana Kalogeraki, Vassilis Tsotras, Michail Vlachos, Nick Koudas and Divesh Srivastava, Computer Networks (ComNet '09), Elsevier North-Holland, Vol. 53, Iss. 9, pp. 1431-1449, New York, NY, USA, 2009. [J8] "Metadata ranking and pruning for failure detection in grids. ", Demetrios Zeinalipour-Yazti, Harris Papadakis, Chryssis Georgiou and Marios D. Dikaiakos, Parallel Processing Letters (PPL '08), Vol. 18, Iss. 3, pp. 371-390, 2008. [J7] "pFusion: a P2P architecture for internet-scale content-based search and retrieval", Demetrios Zeinalipour-Yazti, Vana Kalogeraki and Dimitrios Gunopulos, IEEE Transaction on Parallel and Distributed Systems (TPDS '07), IEEE Press, Vol. 18, Iss. 6, pp. 804-817, Piscataway, NJ, USA, 2007. [J6] "Distributed middleware architectures for scalable media services", Vana Kalogeraki, Demetrios Zeinalipour-Yazti, Dimitrios Gunopulos and Alex Delis, Journal of Network and Computer Applications (JNCA '07), Elsevier Press Ltd., Vol. 30, Iss. 1, pp. 209-243, London, UK, UK, 2007. [J5] "Efficient indexing data structures for flash-based sensor devices", Song Lin, Demetrios Zeinalipour-Yazti, Vana Kalogeraki, Dimitrios Gunopulos and Walid A. Najjar, ACM Transactions on Storage (TOS '06), ACM, Vol. 2, Iss. 4, pp. 468-503, New York, NY, USA, 2006. [J4] "Structuring topologically aware overlay networks using domain names", Demetrios Zeinalipour-Yazti and Vana Kalogeraki, Computer Networks (ComNet '06), Elsevier North-Holland, Vol. 50, Iss. 16, pp. 3064-3082, New York, NY, USA, 2006. [J3] "Exploiting locality for scalable information retrieval in peer-to-peer networks", Demetrios Zeinalipour-Yazti, Vana Kalogeraki and Dimitrios Gunopulos, Information Systems (InfoSys '05), Elsevier Science Ltd., Vol. 30, Iss. 4, pp. 277-298, Oxford, UK, UK, 2005. [J2] "A distributed middleware infrastructure for personalized services", Marios D Dikaiakos and Demetris Zeinalipour-Yazti, Computer Communications (ComCom '04), Vol. 27, Iss. 15, pp. 1464 - 1480, 2004. [J1] "Information retrieval techniques for peer-to-peer networks", Demetrios Zeinalipour-Yazti, Vana Kalogeraki and Dimitrios Gunopulos, Computing in Science and Engineering (CISE '04), IEEE Educational Activities Department, Vol. 6, Iss. 4, pp. 20-26, Piscataway, NJ, USA, 2004. [C79] "Generating Semantic Aspects for Queries", Dhruv Gupta, Klaus Berberich, Jannik Strötgen, Demetrios Zeinalipour-Yazti, Proceedings of the 16th International Semantic Web Conference (ESWC '19), Springer LNCS, pp. 15, June 2nd to June 6th, 2019, Portorož, Slovenia, 2019. [C78] "A Qualitative and Quantitative Evaluation of Differential Signal Strength Fingerprinting Methods", Christos Laoudias, Sunwoo Kim, Christos Panayiotou and Demetrios Zeinalipour-Yazti, Proceedings of the 53rd IEEE International Conference on Communications (ICC) / WC Symposium (ICC '19), IEEE Communications Society, 20-24 May, 2019, Shanghai, China, 2019. [C77] "Bridging Quantities in Tables and Text", Yusra Ibrahim, Mirek Riedewald, Gerhard Weikum and Demetrios Zeinalipour-Yazti, Proceedings of the 35th IEEE International Conference on Data Engineering (ICDE '19), IEEE Computer Society, 8-12 April 2019, Macau SAR, China, 2019. [C76] "Telco Big Data Research and Open Problems", Constantinos Costa and Demetrios Zeinalipour-Yazti, Proceedings of the 35th IEEE International Conference on Data Engineering (ICDE '19), IEEE Computer Society, 8-12 April 2019, Macau SAR, China, 2019. [C74] "Future Directions for Indoor Information Systems: A Panel Discussion", Demetrios Zeinalipour-Yazti, Proceedings of the 19th IEEE International Conference on Mobile Data Management (MDM '18), IEEE Computer Society, ISBN: 978-1-5386-4133-0, pp. 1--2, June 28, 2018, AAU, Aalborg, Denmark, 2018. [C73] "Telco Big Data: Current State & Future Directions", Constantinos Costa and Demetrios Zeinalipour-Yazti, Proceedings of the 19th IEEE International Conference on Mobile Data Management (MDM '18), IEEE Computer Society, ISBN: 978-1-5386-4133-0, pp. 11--12, June 27, 2018, Aalborg, Denmark, 2018. [C71] "TBD-DP: Telco Big Data Visual Analytics with Data Postdiction", Constantinos Costa, Andreas Charalampous, Andreas Konstantinidis, Mohamed F. Mokbel, Proceedings of the 19th IEEE International Conference on Mobile Data Management (MDM '18), IEEE Computer Society, ISBN: 978-1-5386-4133-0, pp. 280--281, June 25 - June 28, 2018, AAU, Aalborg, Denmark, 2018. [C70] "EPUI: Experimental Platform for Urban Informatics", Xiaoyi Ge, Panos K. Chrysanthis, Konstantinos Pelechrinis, and Demetrios Zeinalipour-Yazti, Proceedings of the 2018 ACM International Conference on Management of Data (SIGMOD '18), ACM Press, ISBN: 978-1-4503-4703-7, pp. 1761--1764, June 10 – 15, 2018, Houston, Texas, USA, 2018. [C69] "Generating Semantic Aspects for Queries", Dhruv Gupta, Klaus Berberich, Jannik Strötgen, Demetrios Zeinalipour-Yazti, Proceedings of the 18th ACM/IEEE Joint Conference on Digital Libraries (JCDL '18), ACM Press, ISBN: 978-1-4503-5178-2, pp. 335-336, June 3-6, 2018, Fort Worth, Texas, USA, 2018. [C68] "Towards Real-Time Road Traffic Analytics using Telco Big Data", Constantinos Costa, Georgios Chatzimilioudis, Demetrios Zeinalipour-Yazti, Mohamed F. Mokbel, Proceedings of the 11th Intl. Workshop on Real-Time Business Intelligence and Analytics, collocated with VLDB 2017 (BIRTE '17), ACM International Conference Proceedings Series, pp. 5:1--5:5, August 28, 2017, Munich, Germany, ISBN: 978-1-4503-5425-7/17/08, 2017. [C67] "Data-driven Serendipity Navigation in Urban Places", Xiaoyi Ge, Ameya Daphalapurkar, Manali Shmipi, Kohli Darpun, Konstantinos Pelechrinis, Panos K. Chrysanthis, and Demetrios Zeinalipour-Yazti, Proceedings of the 37th IEEE International Conference on Distributed Computing Systems (ICDCS '17), IEEE Computer Society, pp. 2501--2504, June 5 – 8, 2017, Atlanta, GA, USA, 2017. [C65] "ACCES: Offline Accuracy Estimation for Fingerprint-based Localization", Artyom Nikitin, Christos Laoudias, Georgios Chatzimilioudis, Panagiotis Karras and Demetrios Zeinalipour-Yazti, Proceedings of the 18th IEEE International Conference on Mobile Data Management (MDM '17), IEEE Computer Society, pp. 358--359, May 29 - June 1, 2017, Daejeon, South Korea, 2017. [C64] "Efficient Exploration of Telco Big Data with Compression and Decaying", Constantinos Costa, Georgios Chatzimilioudis, Demetrios Zeinalipour-Yazti, Mohamed F. Mokbel, Proceedings of the IEEE 33rd International Conference on Data Engineering (ICDE '17), IEEE Computer Society, pp. 1332-1343, April 19-22, 2017, San Diego, CA, USA, ISBN: 978-1-5090-6543-1, 2017. [C63] "SPATE: Compacting and Exploring Telco Big Data", Constantinos Costa, Georgios Chatzimilioudis, Demetrios Zeinalipour-Yazti, Mohamed F. Mokbel, Proceedings of the IEEE 33rd International Conference on Data Engineering (ICDE '17), IEEE Computer Society, pp. 1419-1420, April 19-22, 2017, San Diego, CA, USA, ISBN: 978-1-5090-6543-1, 2017. [C62] "Distributed In-Memory Processing of All k Nearest Neighbor Queries (Extended Abstract)", Georgios Chatzimilioudis, Constantinos Costa, Demetrios Zeinalipour-Yazti, Wang-Chien Lee and Evaggelia Pitoura, Proceedings of the IEEE 32nd International Conference on Data Engineering (ICDE '16), IEEE Computer Society, pp. 1490--1491, Helsinki, Finland, ISBN: 978-1-5090-2020-1, 2016. [C61] "Privacy-Preserving Indoor Localization on Smartphones (Extended Abstract)", Andreas Konstantinidis, Georgios Chatzimilioudis, Demetrios Zeinalipour-Yazti, Paschalis Mpeis, Nikos Pelekis and Yannis Theodoridis, Proceedings of the IEEE 32nd International Conference on Data Engineering (ICDE '16), IEEE Computer Society, pp. 1470--1471, Helsinki, Finland, ISBN: 978-1-5090-2020-1, 2016. 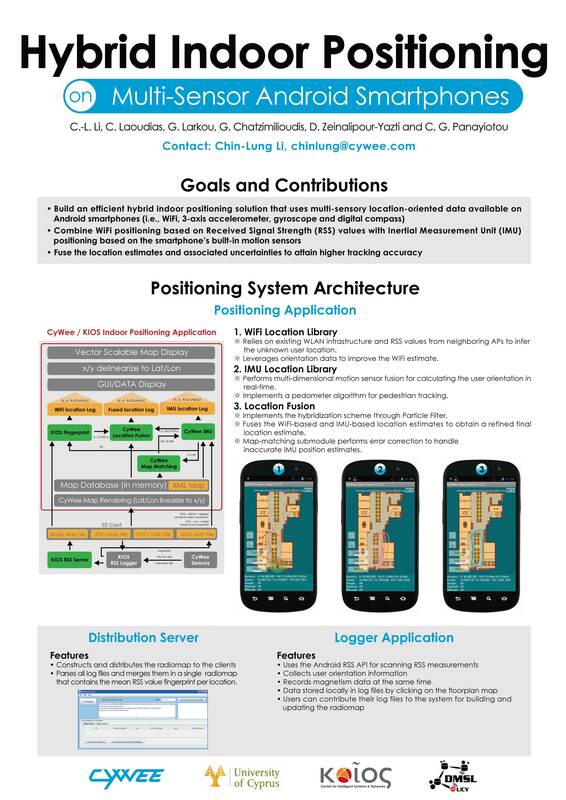 [C59] "Radiomap Prefetching for Indoor Navigation in Intermittently Connected Wi-Fi Networks", Andreas Konstantinidis, George Nikolaides, Georgios Chatzimilioudis, Giannis Evagorou, Demetrios Zeinalipour-Yazti and Panos K. Chrysanthis, Proceedings of the 16th IEEE International Conference on Mobile Data Management (MDM '15), IEEE Press, Vol. 1, pp. 34-43, Pittsburgh, PA, USA, 2015. [C58] "Rayzit: An Anonymous and Dynamic Crowd Messaging Architecture", Constantinos Costa, Chrysovalantis Anastasiou, Georgios Chatzimilioudis and Demetrios Zeinalipour-Yazti, Proceedings of the 3rd IEEE International Workshop on Mobile Data Management, Mining, and Computing on Social Networks, collocated with IEEE MDM '15 (Mobisocial '15), Vol. 2, pp. 98-103, Pittsburgh, PA, USA, 2015. [C57] "Scalable Mockup Experiments on Smartphones using SmartLab", Georgios Larkou, Marios Mintzis, Panayiotis G. Andreou, Andreas Konstantinidis and Demetrios Zeinalipour-Yazti, Proceedings of the 16th IEEE International Conference on Mobile Data Management (MDM '15), IEEE Press, Vol. 2, pp. 287-290, 2015. [C56] "Anyplace: A Crowdsourced Indoor Information Service", Kyriakos Georgiou, Timotheos Constambeys, Christos Laoudias, Lambros Petrou, Georgios Chatzimilioudis and Demetrios Zeinalipour-Yazti, Proceedings of the 16th IEEE International Conference on Mobile Data Management (MDM '15), IEEE Press, Vol. 2, pp. 291-294, 2015. [C55] "Mobile Data Management in Indoor Spaces", Christos Laoudias and Demetrios Zeinalipour-Yazti, Proceedings of the 16th IEEE International Conference on Mobile Data Management (MDM '15), IEEE Press, Vol. 1, pp. 11-14, 2015. [C54] "Mobile Big Data Analytics: Research, Practice, and Opportunities", Demetrios Zeinalipour-Yazti, Shonali Krishnaswamy, Proceedings of the 15th IEEE International Conference on Mobile Data Management (MDM '14), IEEE Press, Vol. 1, pp. 1-2, 2014. [C53] "Sensor Mockup Experiments with SmartLab", Georgios Larkou, Marios Mintzis, Stefano Taranto, Andreas Konstantinidis, Panayiotis G. Andreou, Demetrios Zeinalipour-Yazti, Proceedings of the 13th International Conference on Information Processing in Sensor Networks (IPSN '14), Berlin, Germany IEEE Press, pp. 339-340, Berlin, Germany, April 15-17, ISBN: 978-1-4799-3146-0, 2014. [C52] "Crowdsourced Indoor Localization and Navigation with Anyplace", Lambros Petrou, Georgios Larkou, Christos Laoudias, Demetrios Zeinalipour-Yazti, Christos G. Panayiotou, Proceedings of the 13th International Conference on Information Processing in Sensor Networks (IPSN '14), Berlin, Germany IEEE Press, pp. 331-332, Berlin, Germany, April 15-17, ISBN: 978-1-4799-3146-0, 2014. [C51] "Managing Smartphone Testbeds with SmartLab", Georgios Larkou, Constantinos Costa, Panayiotis Andreou, Andreas Konstantinidis, Demetrios Zeinalipour-Yazti, Proceedings of the 27th USENIX Large Installation System Administration Conference (LISA '13), Washington D.C., USA pp. 115-132, ISBN: 978-1-931971-05-8, 2013. [C50] "Indoor Positioning and Navigation in the Big-Data Era", Lambros Petrou, Georgios Larkou, Christos Laoudias, Demetrios Zeinalipour-Yazti and Christos G. Panayiotou, Proceedings of the 4th Intl. Conference on Indoor Positioning and Indoor Navigation (IPIN '13), Montbeliard-Belfort, France 2013. [C49] "Crowdsourced Indoor Localization for Diverse Devices through Radiomap Fusion", Christos Laoudias, Demetrios Zeinalipour-Yazti and Christos G. Panayiotou, Proceedings of the 4th Intl. Conference on Indoor Positioning and Indoor Navigation (IPIN '13), Montbeliard-Belfort, France pp. 1-7, 2013. [C48] "Demo: Indoor Geolocation on Multi-Sensor Smartphones", Chin-Lung Li, Christos Laoudias, Georgios Larkou, Yu-Kuen Tsai, Demetrios Zeinalipour-Yazti and Christos G. Panayiotou, Proceedings of the 11th International Conference on Mobile Systems, Applications and Services (Mobisys '13), pp. 503-504, Taipei, Taiwan, June 25 - 28, ISBN: 978-1-4503-1672-9, 2013. [C47] "Crowdsourcing for Mobile Data Management (Tutorial)", Georgios Chatzimilioudis and Demetrios Zeinalipour-Yazti, Proceedings of the 14th IEEE International Conference on Mobile Data Management (MDM '13), Milan, Italy Vol. 2, pp. 3-4, 2013. [C46] "CLODA: A Crowdsourced Linked Open Data Architecture", Georgios Larkou, Julia Metochi, Georgios Chatzimilioudis and Demetrios Zeinalipour-Yazti, Proceedings of the 1st IEEE International Workshop on Mobile Data Management, Mining, and Computing on Social Networks (Mobisocial '13), Milan, Italy Vol. 2, pp. 104-109, 2013. [C45] "Hybrid Indoor Positioning on Multi-Sensor Android Smartphones", Chin-Lung Li, Christos Laoudias, Georgios Larkou, Georgios Chatzimilioudis, Demetrios Zeinalipour-Yazti and Christos G. Panayiotou, Proceedings of the 3rd Intl. Conference on Indoor Positioning and Indoor Navigation (IPIN '12), Sydney, Australia 2012. [C44] "FireWatch: G.I.S.-assisted Wireless Sensor Networks for Forest Fires", Panayiotis G. Andreou, George Constantinou, Demetrios Zeinalipour-Yazti, George Samaras, Proceedings of the 24th International Conference on Scientiﬁc and Statistical Database Management (SSDBM '12), Springer LNCS Series, Vol. 7338, pp. 618-621, Chania, Greece, ISBN: 978-3-642-31234-2, 2012. [C43] "Continuous all k-nearest neighbor querying in smartphone networks", Georgios Chatzimilioudis, Demetrios Zeinalipour-Yazti, Wang-Chien Lee, Marios D. Dikaiakos, Proceedings of the 13th IEEE International Conference on Mobile Data Management (MDM '12), IEEE Computer Society, pp. 79-88, Bangalore, India, ISBN: 978-0-7695-4713-8, 2012. [C41] "SmartP2P: A Multiobjective Framework for Finding Social Content in P2P Smartphone Networks", Andreas Konstantinidis, Christos Aplitsiotis, Demetrios Zeinalipour-Yazti, Proceedings of the 13th IEEE International Conference on Mobile Data Management (MDM '12), IEEE Computer Society, pp. 324-327, Bangalore, India, ISBN: 978-0-7695-4713-8, 2012. [C40] "Towards planet-scale localization on smartphones with a partial radiomap", Andreas Konstantinidis, Georgios Chatzimilioudis, Christos Laoudias, Silouanos Nicolaou and Demetrios Zeinalipour-Yazti, Proceedings of the 4th ACM international workshop on Hot topics in planet-scale measurement (HotPlanet '12), in conjunction with MobiSys '12, ACM, pp. 9-14, New York, NY, USA, ISBN: 978-1-4503-1318-6, 2012. [C39] "Demo: the airplace indoor positioning platform", Christos Laoudias, Georgios Constantinou, Marios Constantinides, Silouanos Nicolaou, Demetrios Zeinalipour-Yazti and Christos G. Panayiotou, Proceedings of the 10th International Conference on Mobile Systems, Applications and Services (Mobisys '12), pp. 467-468, Low Wood Bay, Lake District UK, June 25 - 29, ISBN: 978-1-4503-1301-8, 2012. [C38] "Demo: a programming cloud of smartphones", Andreas Konstantinidis, Constantinos Costa, Georgios Larkou, Demetrios Zeinalipour-Yazti, Proceedings of the 10th International Conference on Mobile Systems, Applications and Services (Mobisys '12), pp. 465-466, Low Wood Bay, Lake District UK, June 25 - 29, ISBN: 978-1-4503-1301-8, 2012. [C37] "Towards a Network-aware Middleware for Wireless Sensor Networks", Panayiotis Andreou, Demetrios Zeinalipour-Yazti, George Samaras, Panos K. Chrysanthis, Proceedings of the 8th Intl. Workshop on Data Management for Sensor Networks (DMSN '11), in conjunction with VLDB '11, Seattle, WA, USA, 2011. [C36] "Data management techniques for smartphone networks", Demetrios Zeinalipour-Yazti, Proceedings of the 10th ACM International Workshop on Data Engineering for Wireless and Mobile Access (MobiDE '11), Athens, Greece ACM, pp. 25-25, New York, NY, USA, ISBN: 978-1-4503-0656-0, 2011. [C35] "Energy Efficient Data Management in Smartphone Networks", Demetrios Zeinalipour-Yazti, Proceedings of the NSF-sponsored Workshop on Sustainable Energy-Efficient Data Management (SEEDM '11), Arlington, Virginia 2011. [C34] "An Indoor Trajectory Comparison Framework for Android Smartphones", Christos Laoudias, Constantinos Costa, Demetrios Zeinalipour-Yazti, Christos G. Panayiotou, Proceedings of the Intl. Conference on Indoor Positioning and Indoor Navigation (IPIN '11), Guimares, Portugal 2011. [C33] "A Platform for the Evaluation of Fingerprint Positioning Algorithms on Android Smartphones", Christos Laoudias, Georgios Constantinou, Marios Constantinides, Silouanos Nicolaou, Demetrios Zeinalipour-Yazti, Christos G. Panayiotou, Proceedings of the Intl. Conference on Indoor Positioning and Indoor Navigation (IPIN '11), Guimares, Portugal 2011. [C32] "Multi-objective Query Optimization in Smartphone Social Networks", Andreas Konstantinidis, Demetrios Zeinalipour-Yazti, Panayiotis Andreou, George Samaras, Proceedings of the 2011 IEEE 12th International Conference on Mobile Data Management - Volume 01 (MDM '11), IEEE Computer Society, pp. 27-32, Washington, DC, USA, ISBN: 978-0-7695-4436-6, 2011. [C31] "Disclosure-Free GPS Trace Search in Smartphone Networks", Demetrios Zeinalipour-Yazti, Christos Laoudias, Maria I. Andreou, Dimitrios Gunopulos, Proceedings of the 2011 IEEE 12th International Conference on Mobile Data Management - Volume 01 (MDM '11), IEEE Computer Society, pp. 78-87, Washington, DC, USA, ISBN: 978-0-7695-4436-6, 2011. [C30] "SmartTrace: Finding similar trajectories in smartphone networks without disclosing the traces", Constandinos Costa, Christos Laoudias, Demetrios ZeinalipourYazti, Dimitrios Gunopulos, Proceedings of the 2011 IEEE 27th International Conference on Data Engineering (ICDE '11), IEEE Computer Society, pp. 1288-1291, Washington, DC, USA, ISBN: 978-1-4244-8959-6, 2011. [C29] "Minimum-hot-spot query trees for wireless sensor networks", Georgios Chatzimilioudis, Demetrios Zeinalipour-Yazti, Dimitrios Gunopulos, Proceedings of the 9th ACM International Workshop on Data Engineering for Wireless and Mobile Access (MobiDE '10), Indianapolis, Indiana ACM, pp. 33-40, New York, NY, USA, ISBN: 978-1-4503-0151-0, 2010. [C28] "Improving the Dependability of Grids via Short-Term Failure Predictions", Artur Andrzejak and Demetrios Zeinalipour-yazti and Marios D. Dikaiakos, CoreGRID ERCIM Working Group Workshop on Grids, P2P and Service computing (EuroPAR 2009 Workshops) (Europar '09), Springer Press Series, Delft, Netherlands, 2009. [C27] "FSort: external sorting on flash-based sensor devices", Panayiotis Andreou, Orestis Spanos, Demetrios Zeinalipour-Yazti, Panos K. Chrysanthis, George Samaras, Proceedings of the Sixth International Workshop on Data Management for Sensor Networks (DMSN '09), Lyon, France ACM, pp. 10:1-10:6, New York, NY, USA, ISBN: 978-1-60558-777-6, 2009. [C26] "Perimeter-Based Data Replication in Mobile Sensor Networks", Panayiotis Andreou, Demetrios Zeinalipour-Yazti, Maria I. Andreou, Panos K. Chrysanthis, George Samaras,, Proceedings of the 10th International Conference on Mobile Data Management: Systems, Services and Middleware (MDM '09), IEEE Computer Society, pp. 244-251, Washington, DC, USA, ISBN: 978-0-7695-3650-7, 2009. [C25] "KSpot: Effectively Monitoring the K Most Important Events in a Wireless Sensor Network", Panayiotis Andreou, Demetrios Zeinalipour-Yazti, Martha Vasiliadou, Panos K. Chrysanthis, George Samaras, Proceedings of the 2009 IEEE International Conference on Data Engineering (ICDE '09), IEEE Computer Society, pp. 1503-1506, Washington, DC, USA, ISBN: 978-0-7695-3545-6, 2009. [C24] "ETC: Energy-Driven Tree Construction in Wireless Sensor Networks", Panayiotis Andreou, Andreas Pamboris, Demetrios Zeinalipour-Yazti, Panos K. Chrysanthis, George Samaras, Proceedings of the 2009 Tenth International Conference on Mobile Data Management: Systems, Services and Middleware (MDM '09), IEEE Computer Society, pp. 513-518, Washington, DC, USA, ISBN: 978-0-7695-3650-7, 2009. [C23] "Identifying Failures in Grids through Monitoring and Ranking", Kyriacos Neocleous, Chryssis Georgiou, Marios D. Dikaiakos, Proceedings of the 2008 Seventh IEEE International Symposium on Network Computing and Applications (NCA '08), IEEE Computer Society, pp. 291-298, Washington, DC, USA, ISBN: 978-0-7695-3192-2, 2008. [C22] "Workload-Aware Query Routing Trees in Wireless Sensor Networks", Panayiotis Andreou, Demetrios Zeinalipour-Yazti, Panos K. Chrysanthis and George Samaras, Proceedings of the The 9th International Conference on Mobile Data Management (MDM '08), IEEE Computer Society, pp. 189-196, Washington, DC, USA, ISBN: 978-0-7695-3154-0, 2008. [C21] "Seminar: Distributed Top-K Query Processing in Wireless Sensor Networks", Demetrios Zeinalipour-Yazti and Zografoula Vagena, Proceedings of the 9th IEEE International Conference on Mobile Data Management (MDM '08), IEEE Computer Society, Beijing, China, 2008. [C20] "SenseSwarm: A Perimeter-based Data Acquisition Framework for Mobile Sensor Networks", Demetrios Zeinalipour-Yazti, Panayiotis Andreou, Panos K. Chrysanthis, George Samaras, Proceedings of the 4th Intl. Workshop on Data Management for Sensor Networks DMSN (VLDB 2007 Workshops) (DMSN '07), ACM International Conference Proceeding Series, Vienna, Austria, 2007. [C19] "Failrank: Towards a Unified Grid Failure Monitoring and Ranking System. ", Demetrios Zeinalipour-Yazti, Kyriacos Neocleous, Chryssis Georgiou, Marios D. Dikaiakos, CoreGRID Workshop - Making Grids Work Springer, pp. 247-259, ISBN: 978-0-387-78447-2, 2007. [C18] "The MicroPulse Framework for Adaptive Waking Windows in Sensor Networks", Demetrios Zeinalipour-Yazti, Panayiotis Andreou, Panos K. Chrysanthis, George Samaras and Andreas Pitsillides, Proceedings of the 2007 International Conference on Mobile Data Management (MDM '07), IEEE Computer Society, pp. 351-355, Washington, DC, USA, ISBN: 1-4244-1241-2, 2007. [C17] "Intensive Care Window: A Multi-Modal Monitoring Tool for Intensive Care Research and Practice", Harald Gjermundrod, Marios Papa, Demetrios Zeinalipour-Yazti, Marios D. Dikaiakos, George Panayi, Theodoros Kyprianou, Proceedings of the Twentieth IEEE International Symposium on Computer-Based Medical Systems (CBMS '07), IEEE Computer Society, pp. 471-476, Washington, DC, USA, ISBN: 0-7695-2905-4, 2007. [C16] "ICGrid: Enabling Intensive Care Medical Research on the EGEE Grid", Harald Gjermundrod, Marios D. Dikaiakos, Demetrios Zeinalipour-Yazti, George Panayi, Theodoros Kyprianou, 5th HealthGrid Conference (HealthGrid 2007) IOS Press, Geneva, Switzerland, 2007. [C15] "MINT Views: Materialized In-Network Top-k Views in Sensor Networks", Demetrios Zeinalipour-Yazti, Panayiotis Andreou, Panos K. Chrysanthis, George Samaras, Proceedings of the 2007 International Conference on Mobile Data Management (MDM '07), IEEE Computer Society, pp. 182-189, Washington, DC, USA, ISBN: 1-4244-1241-2, 2007. [C14] "Distributed Spatio-Temporal Trajectory Retrieval", Demetrios Zeinalipour-Yazti, Song Lin, Dimitrios Gunopulos, Proceedings of the ACM 15th Conference on Information and Knowledge Management (CIKM '06), ACM Press, Arlington, VA, USA, 2006. [C13] "Efficient Online State Tracking Using Sensor Networks", M. Halkidi, Vana Kalogeraki, Dimitrios Gunopulos, Dimitris Papadopoulos, Demetrios Zeinalipour-Yazti and Michail Vlachos, Proceedings of the 7th International Conference on Mobile Data Management (MDM '06), IEEE Computer Society, pp. 24-, Washington, DC, USA, ISBN: 0-7695-2526-1, 2006. [C12] "Microhash: an efficient index structure for fash-based sensor devices", Demetrios Zeinalipour-Yazti, Song Lin, Vana Kalogeraki, Dimitrios Gunopulos, Walid Najjar, Proceedings of the 4th USENIX Conference on File and Storage Technologies (FAST '05), San Francisco, CA USENIX Association, pp. 31-44, Berkeley, CA, USA, 2005. [C11] "The threshold join algorithm for top-k queries in distributed sensor networks", Demetrios Zeinalipour-Yazti, Zografoula Vagena, Dimitrios Gunopulos, Vana Kalogeraki, Vassilis Tsotras, Michail Vlachos, Nick Koudas, Divesh Srivastava, Proceedings of the 2nd international workshop on Data management for sensor networks (DMSN '05), Trondheim, Norway ACM, pp. 61-66, New York, NY, USA, ISBN: 1-59593-206-2, 2005. [C10] "RISE - Co-S : high performance sensor storage and Co-processing architecture", Anirban Banerjee, Abhishek Mitra, Walid Najjar, Demetrios Zeinalipour-Yazti, Vana Kalogeraki and Dimitrios Gunopulos, Sensor and Ad Hoc Communications and Networks, 2005. IEEE SECON 2005. 2005 Second Annual IEEE Communications Society Conference on (SECON '05), pp. 1 - 12, California USA, 2005. [C9] "High performance, low power sensor platforms featuring gigabyte scale storage", Abhishek Mitra, Anirban Banerjee, Walid Najjar, Demetrios Zeinalipour-Yazti, Vana Kalogeraki and Dimitrios Gunopulos, Proceedings of the Third International Workshop on Measurement, Modeling, and Performance Analysis of Wireless Sensor Networks (SenMetrics '05), San Diego, CA, 2005. [C8] "Data Acquisition in Sensor Networks with Large Memories", Demetrios Zeinalipour-Yazti, Som Neema, Dimitrios Gunopulos, Vana Kalogeraki, Walid Najjar, Proceedings of the 21st International Conference on Data Engineering Workshops (ICDE '05), IEEE Computer Society, pp. 1188-, Washington, DC, USA, ISBN: 0-7695-2657-8, 2005. [C7] "Nodes: A novel system design for embedded sensor networks", Som Neema, Abhishek Mitra, Anirban Banerjee, Walid Najjar, Demetrios ZeinalipourYazti, Dimitrios Gunopulos, Vana Kalogeraki, In IEEE Intl. Conference on Information Processing in Sensor Networks (IPSN '05), Los Angeles, CA, 2005. [C6] "Self-star Properties in Complex Information Systems", Vana Kalogeraki, Fang Chen, Thomas Repantis and Demetrios Zeinalipour-Yazti, Springer-Verlag, pp. 325-342, Berlin, Heidelberg, ISBN: 3-540-26009-9, 978-3-540-26009-7, 2005. [C5] "On constructing internet-scale p2p information retrieval systems", Demetrios Zeinalipour-Yazti, Vana Kalogeraki and Dimitrios Gunopulos, Proceedings of the Second international conference on Databases, Information Systems, and Peer-to-Peer Computing (DBISP2P '04), Toronto, Canada Springer-Verlag, pp. 136-150, Berlin, Heidelberg, ISBN: 3-540-25233-9, 978-3-540-25233-7, 2005. [C4] "A local search mechanism for peer-to-peer networks", Vana Kalogeraki, Dimitrios Gunopulos and Demetrios Zeinalipour-Yazti, Proceedings of the eleventh international conference on Information and knowledge management (CIKM '02), McLean, Virginia, USA ACM, pp. 300-307, New York, NY, USA, ISBN: 1-58113-492-4, 2002. [C3] "Design and Implementation of a Distributed Crawler and Filtering Processor", Demetrios Zeinalipour-Yazti and Marios D. Dikaiakos, Proceedings of the 5th International Workshop on Next Generation Information Technologies and Systems (NGITS '02), Springer-Verlag, pp. 58-74, London, UK, UK, ISBN: 3-540-43819-X, 2002. [C2] "WebRACE: A Distributed WWW Retrieval, Annotation, and Caching Engine", Marios D. Dikaiakos and Demetrios Zeinalipour-yazti, International Workshop on Performance-oriented Application Development for Distributed Architectures (PADDA '01), Munich, Germany, 2001. [C1] "Collaboration through Navigation: The Case of a Web-based Helpdesk System", Marios D. Dikaiakos, Demetrios Zeinalipour-Yazti, Proceedings of the 9th International World-Wide Web Conference (WWW 2000) (WWW '00), Amsterdam, Netherlands, 2000. [B11] "The Anatomy of the Anyplace Indoor Navigation Service", Demetrios Zeinalipour-Yazti and Christos Laoudias, ACM SIGSPATIAL Special (SIGSPATIAL '17), ACM Press, Vol. 9, pp. 3-10, 2017. [B10] "Privacy-Preserving Indoor Localisation and Navigation", Andreas Konstantinidis, Georgios Chatzimilioudis and Demetrios Zeinalipour-Yazti, ERCIM News 106, Special theme: Cybersecurity ISBN: 0926-4981, 2016. [B9] "Nearest Neighbor Queries on Big Data", Georgios Chatzimilioudis, Andreas Konstantinidis and Demetrios Zeinalipour-Yazti, Information Granularity, Big Data, and Computational Intelligence (Studies in Big Data), Springer Press, Vol. 8, pp. 3-22, ISBN: 978-3-319-08253-0, 2014. [B8] "A P2P Search Framework for Intelligent Mobile Crowdsourcing", Andreas Konstantinides and Demetrios Zeinalipour-Yazti, Opportunistic Mobile Social Networks (Studies in Computational Intelligence), CRC Press, pp. 377-405, ISBN: 978-1-4665-9494-4, 2014. [B7] "Airplace: Indoor Geolocation on Smartphones Through WiFi Fingerprinting", Christos Laoudias, and Georgios Larkou, and Demetrios Zeinalipour-Yazti, and Christos G. Panayiotou, ERCIM News 93, Special theme: Mobile Computing ISBN: 0926-4981, 2013. [B6] "SmartLab: Empowering Mobile Computing Research through an Open Smartphone Cloud", Georgios Larkou, and Panayiotis Andreou, and Andreas Konstantinidis, and Demetrios Zeinalipour-Yazti, ERCIM News 93, Special theme: Mobile Computing ISBN: 0926-4981, 2013. [B5] "Online Social Networks: Status and Trends", George Pallis, and Demetrios Zeinalipour-Yazti and Marios Dikaiakos, New Directions in Web Data Management 1 (Studies in Computational Intelligence), Springer Press, Vol. 331, pp. 213-234, ISBN: 978-3-642-17550-3, 2011. [B4] "Improving the Dependability of Grids via Short-Term Failure Predictions", Artur Andrzejak, Demetrios Zeinalipour-yazti and Marios D. Dikaiakos, Grids, P2P and Services Computing Springer Press, ISBN: 978-1-4419-6793-0, 2010. [B3] "Mobile sensor network data management", Demetrios Zeinalipour-Yazti and Panos K. Chrysanthis, Encyclopedia of Database Systems (EDBS '09), ISBN: 978-0-387-49616-0, 2009. [B2] "Top-k Retrieval Techniques in Distributed Sensor Systems", Song Lin, Demetrios Zeinalipour-Yazti and Dimitrios Gunopulos, Encyclopedia of GIS (EGIS '08), Springer US, pp. 1161-1168, ISBN: 978-0-387-35973-1, 2008. [B1] "Failrank: Towards a Unified Grid Failure Monitoring and Ranking System", Demetrios Zeinalipour-Yazti, Kyriakos Neocleous, Chryssis Georgiou and Marios D. Dikaiakos, CoreGRID Workshop - Making Grids Work Springer, pp. 247-259, ISBN: 978-0-387-78447-2, 2007. [E6] Marcin Wojnarski, Pawel Gora, Marcin Szczuka, Hung Son Nguyen, Joanna Swietlicka and Demetrios Zeinalipour-Yazti, Proceedings of the 10th IEEE International Conference on Data Mining Contest (ICDM-Contest '10), Sydney, Australia IEEE Computer Society, ISBN: 978-1-4503-0416-0, 2010. [E5] Demetrios Zeinalipour-Yazti and Wang-Chien Lee, Proceedings of the 7th International Workshop on Data Management for Sensor Networks (DMSN '10), Singapore ACM International Conference Proceeding Series, ACM Press, New York, NY, USA, ISBN: 978-1-4503-0416-0, 2010. [E4] Rizos Sakellariou, Salvatore Orlando, Josep-Lluis Larriba-Pey, Srinivasan Parthasarathy, Demetrios Zeinalipour-Yazti, Proceedings of the 16th Intl. Conference on Parallel Processing (Euro-Par '10), Ischia Italy Lecture Notes in Computer Science / Theoretical Computer Science and General Issues, Springer Press, ISBN: 978-3-642-15276-4, 2010. [E3] Phillip B. Gibbons, Demetrios Zeinalipour-Yazti, Hui Lei, Suman Nath, Proceedings of the 9th ACM International Workshop on Data Engineering for Wireless and Mobile Access (MobiDE '10), Rhode Island, USA ACM Press, New York, NY, USA, ISBN: 978-1-4503-0151-0, 2010. [E2] Takahiro Hara, Christian S. Jensen, Vijay Kumar, Sanjay Madria, Demetrios Zeinalipour-Yazti, Proceedings of the 11th Intl. Conference on Mobile Data Management (MDM '10), Kansas City, Missouri, USA IEEE Computer Society, ISBN: 978-0-7695-4048-1, 2010. [E1] Yannis Kotidis, Pedro Jose Marron, Le Gruenwald, Demetrios Zeinalipour-Yazti, Proceedings of the 8th ACM International Workshop on Data Engineering for Wireless and Mobile Access (MobiDE '09), Providence, Rhode Island, USA ACM Press, New York, NY, USA, ISBN: 978-1-60558-712-7, 2009. [T3] "Search and Retrieval Algorithms for Distributed Data Management Systems", Demetrios Zeinalipour-Yazti, PhD Dissertation Dept. of Computer Science & Engineering, University of California, Riverside, 2005. [T2] "Information Retrieval in Peer-to-Peer Systems", Demetrios Zeinalipour-Yazti, M.Sc. Thesis Dept. of Computer Science & Engineering, University of California, Riverside, 2003. [T1] "eRACE: eXtensible Retrieval Annotation and Caching Engine", Demetrios Zeinalipour-Yazti, B.Sc. Thesis Dept. of Computer Science, University of Cyprus, 2000. [G25] "Indoor Localization Accuracy Estimation from Fingerprint Data", Artyom Nikitin, Christos Laoudias, Georgios Chatzimilioudis, Panagiotis Karras and Demetrios Zeinalipour-Yazti, The 15th Hellenic Data Management Symposium (unofficial proceedings) (HDMS '17), Athens, Greece, 2017. [G24] "ACCES: Offline Accuracy Estimation for Fingerprint-based Localization", Artyom Nikitin, Christos Laoudias, Georgios Chatzimilioudis, Panagiotis Karras and Demetrios Zeinalipour-Yazti, The 15th Hellenic Data Management Symposium (unofficial proceedings) (HDMS '17), Athens, Greece, 2017. [G23] "Efficient Exploration of Telco Big Data with Compression and Decaying", Constantinos Costa, Georgios Chatzimilioudis, Demetrios Zeinalipour-Yazti, Mohamed F. Mokbel, The 15th Hellenic Data Management Symposium (unofficial proceedings) (HDMS '17), Athens, Greece, 2017. [G22] "SPATE: Compacting and Exploring Telco Big Data", Constantinos Costa, Georgios Chatzimilioudis, Demetrios Zeinalipour-Yazti, Mohamed F. Mokbel, The 15th Hellenic Data Management Symposium (unofficial proceedings) (HDMS '17), Athens, Greece, 2017. [G21] "Distributed In-Memory Processing of All k Nearest Neighbor Queries", Georgios Chatzimilioudis, Constantinos Costa, Demetrios Zeinalipour-Yazti, Wang-Chien Lee and Evaggelia Pitoura, The 14th Hellenic Data Management Symposium (unofficial proceedings) (HDMS '16), Athens, Greece, 2016. [G20] "Privacy-Preserving Indoor Localization on Smartphones", Andreas Konstantinidis, Georgios Chatzimilioudis, Demetrios Zeinalipour-Yazti, Paschalis Mpeis, Nikos Pelekis and Yannis Theodoridis, The 14th Hellenic Data Management Symposium (unofficial proceedings) (HDMS '16), Athens, Greece, 2016. [G19] "Radiomap Prefetching for Indoor Navigation in Intermittently Connected Wi-Fi Networks", Andreas Konstantinidis, George Nikolaides, Georgios Chatzimilioudis, Giannis Evagorou, Demetrios Zeinalipour-Yazti and Panos K. Chrysanthis, The 13th Hellenic Data Management Symposium (unofficial proceedings) (HDMS '15), Athens, Greece, 2015. [G18] "Anyplace: A Crowdsourced Indoor Information Service", Kyriakos Georgiou, Timotheos Constambeys, Christos Laoudias, Lambros Petrou, Georgios Chatzimilioudis and Demetrios Zeinalipour-Yazti, The 13th Hellenic Data Management Symposium (unofficial proceedings) (HDMS '15), Athens, Greece, 2015. [G17] "Proximity Interactions with Crowdcast", Marios Constantinides, George Constantinou, Andreas Panteli, Theophilos Phokas, Georgios Chatzimilioudis, Demetrios Zeinalipour-Yazti, The 11th Hellenic Data Management Symposium (unofficial proceedings) (HDMS '12), Chania, Greece, 2012. [G16] "Continuous all k-nearest neighbor querying in smartphone networks", Georgios Chatzimilioudis, Demetrios Zeinalipour-Yazti, Wang-Chien Lee, Marios D. Dikaiakos, The 11th Hellenic Data Management Symposium (unofficial proceedings) (HDMS '12), Chania, Greece, 2012. [G15] "Multi-objective Query Optimization in Smartphone Social Networks", Andreas Konstantinidis, Demetrios Zeinalipour-Yazti, Panayiotis Andreou, George Samaras, The 10th Hellenic Data Management Symposium (unofficial proceedings) (HDMS '11), Athens, Greece, 2011. [G14] "Disclosure-Free GPS Trace Search in Smartphone Networks", Christos Laoudias, Maria I. Andreou, Dimitrios Gunopulos, The 10th Hellenic Data Management Symposium (HDMS '11), Athens, Greece, 2011. [G13] "SmartTrace: Finding similar trajectories in smartphone networks without disclosing the traces", Constandinos Costa, Christos Laoudias, Demetrios ZeinalipourYazti, Dimitrios Gunopulos, The 10th Hellenic Data Management Symposium (unofficial proceedings) (HDMS '11), Athens, Greece, 2011. [G12] "Socially-aware Query Routing in Mobile Networks", Andreas Konstantinidis, Demetrios Zeinalipour-Yazti, Kun Yang, The 9th Hellenic Data Management Symposium (unofficial proceedings) (HDMS '10), Ayia Napa, Cyprus, 2010. [G11] "Minimum-Hot-Spot Query Trees for Wireless Sensor Networks", Georgios Chatzimilioudis, Demetrios Zeinalipour-Yazti, Dimitrios Gunopulos, The 9th Hellenic Data Management Symposium (unofficial proceedings) (HDMS '10), Ayia Napa, Cyprus, 2010. [G10] "A Distributed Spatio-Temporal Similarity Search Framework using Android-based Smartphones (demo)", Constantinos Costa, Christoforos Christoforou, George Nicolaides, Diomides Papadiomidous, Christos Laoudias, Demetrios Zeinalipour-Yazti, The 9th Hellenic Data Management Symposium (unofficial proceedings) (HDMS '10), Ayia Napa, Cyprus, 2010. [G9] "Perimeter-Based Data Replication and Aggregation in Mobile Sensor Networks", Panayiotis Andreou, Demetrios Zeinalipour-Yazti, Maria Andreou, Panos K. Chrysanthis, George Samaras, 8th Hellenic Data Management Symposium (unofficial proceedings) (HDMS '09), Athens, Greece, 2009. [G8] "KSpot: Effectively Monitoring the K Most Important Events in a Wireless Sensor Network", Panayiotis Andreou, Demetrios Zeinalipour-Yazti, Martha Vassiliadou, Panos K. Chrysanthis, George Samaras, 8th Hellenic Data Management Symposium (unofficial proceedings) (HDMS '09), Athens, Greece, 2009. [G7] "Workload-Aware Query Routing Trees in Wireless Sensor Networks", Panayiotis Andreou, Demetrios Zeinalipour-Yazti, Panos Chrysanthis and George Samaras, 7th Hellenic Data Management Symposium (unofficial proceedings) (HDMS '08), Heraklion. Greece, 2008. [G6] "MINT Views: Materialized In-Network Top-k Views in Sensor Networks", Demetrios Zeinalipour-Yazti, Panayiotis Andreou, Panos Chrysanthis and George Samaras, The 6th Hellenic Data Management Symposium (unofficial proceedings) (HDMS '07), Athens, Greece, 2007. [G5] "Distributed Spatio-Temporal Similarity Search", Demetrios Zeinalipour-Yazti, Song Lin, Dimitrios Gunopulos, The 6th Hellenic Data Management Symposium (unofficial proceedings) (HDMS '07), Athens, Greece, 2007. [G4] "Automatically annotating the ODP Web taxonomy", Christiana Christophi, Demetrios Zeinalipour-Yazti, Marios D. Dikaiakos, George Paliouras, Web Search and Mining Track of the 11th Panhellenic Conference on Informatics (PCI '07), Springer Press, Patras, Greece, 2007. [G3] "Efficient Online State Tracking Using Sensor Networks", Maria Halkidi, Vana Kalogeraki, Dimitrios Gunopulos, Dimitrios Papadopoulos, Demetrios. Zeinalipour-Yazti, and Michalis Vlachos, The 5th Hellenic Data Management Symposium (HDMS '06), Thessaloniki, Greece, 2006. [G2] "Towards In-Situ Data Storage in Sensor Databases", Demetrios Zeinalipour-Yazti, Vana Kalogeraki, Dimitrios Gunopulos, Abishek Mitra, Anirban Banerjee and Walid Najjar, 10th Panhellenic Conference on Informatics (PCI '05), Springer 2005, pp. 36-46, Volos, Greece, ISBN: 3-540-29673-5, 2005. [G1] "High-Performance Crawling and Filtering in Java", Demetrios Zeinalipour-Yazti, Marios Dikaiakos, 8th Panhellenic Conference on Informatics (PCI '01), Nicosia, Cyprus, 2001.